Our first full day on the island, and quite busy it was too. After a hearty breakfast we all geared up. Dave jumped into his waterproof pants and almost knee high gumboots. I looked at him in disbelief… outside we had clear a blue sky and sunshine that would make any summer’s day appear rather shady. I had the same gear with me but decided to stick to my tramping boots and gaiters. We shouldered our backpacks that had some water, notebooks and Palm handheld computers. And off we went, over the short boardwalk past the old castaway depot (now a tool shed ) and across the rocks beyond the penguin landing area in Station Cove. The destination of our short tramp was the our supposed workplace, the Snares penguin colony A4. The colony is located just some 100m above the hut, but it still takes about 15 minutes to get there. There is a flagged route that winds through the Oleria forest and it actually has some very short boardwalk bits. 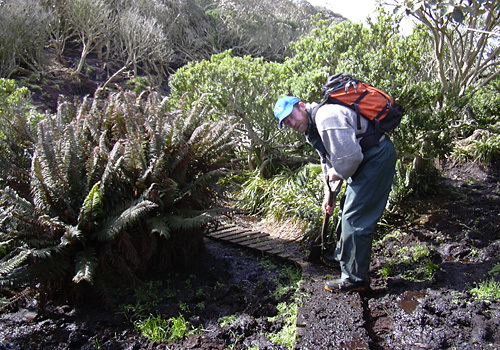 However, the boardwalks won’t fool you… you’re not on a New Zealand backcountry track. Firstly, there are so many small, medium to large branches that constantly try to poke the tramper in the face. I learned on this first trip up the hill that I should under no circumstance go up here without a hat or cap on – an indispensable piece of armour against botanical stabs. Secondly, there are knee deep bogs that look pretty harmless until you step into them. And I am not talking about accidentally slipping into a mud hole. I mean purposely, intentionally, being-bloody-fully-aware-what-is-going-to-happen sort of stepping into pools of mud because they are the only way to get through the otherwise impenetrable tangle of (viciously stabbing!) vegetation. It took me only 50 meters of walking to realise what a mistake it was not to wear the waterproof pants. 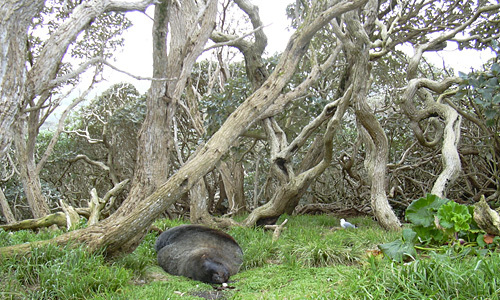 Thirdly, there are sea lions in the most unexpected places all along the track and you have to be very careful not to step on any tree trunks if you can avoid it. The trunk might turn out to be a sleeping sealion, and I don’t think the beast are too pleased to be stepped on by a skinny bi-ped. Fortunately, there is some sort of a sealion warning system installed for the tramper. It is called Red-billed gull – when you see a gull in the middle of the forest, you know there is a sealion somewhere nearby. I must say that the short hike up to colony A4 already gave me the opportunity to get acquainted with the feeling of sudden panic when you spot a Red-billed gull very close to you without seeing its object of desire, i.e. the sealion. The gulls are there because they really treasure the stuff sealions throw up at regular intervals when they sleep – generally indigestible items such as bones or squid beaks. But of course there’s always something juicy coming out as well. Disgusting to us but a feast for the gulls. To me, the Snares penguin colony A4 was quite impressive. 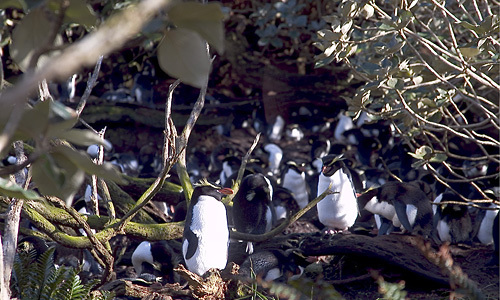 In the middle of the forest there is this patch of mud which is crowded by the most beautiful penguin species I have had the chance to observe. Most birds were sitting in pairs at or around their nest mounds. Some of them dozing with their bills tucked behind their flippers, others preening their partner’s feathers. Non-breeding birds lined the fringes of the colony, they sat perched on branches of Olearia trees and basked in the sun. And that brings us directly to a problem we have… the entire colony is literally engulfed by Olearia thickets that will be pretty hard to get through. Yet, in order to deploy daata loggers – and to get them back later on – we have to be able to get to our logger penguins without causing to much disturbance to the other birds. That is pretty much not given here in colony A4. Unfortunately, our permit restricts us to work someplace else – and after the ordeal we went through to get the permits this might be a bigger problem than it seems. Dave, as official DOC representative agreed with me and decided that we check out the working conditions at the next big colony A3, which is only a couple of hundered meters further inland from A4. As I said, I thought A4 was impressive. Boy, was I in for a surprise. 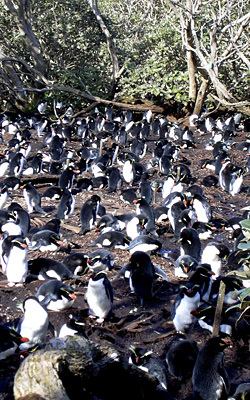 Colony A3 is one of the biggest Snares penguin colonies on the island. Roundabout 1.200 pairs occupy half a football-field-sized clearing. In the bright sunlight all I saw was black and white. Never before have I seen that many penguins in one spot. The din was enormous, in a colony of that size there are always 20-30 pairs displaying and trumpeting, so it is a neverending cacophony of penguin honking. It is actually quite beautiful. The colony was a lot more open and accessible than A4. Just as in the other colony, most of the birds here were pairs on and at their nest sites. There wasn’t a lot of activity amongst the breeders other than sleeping, preening, scratching or turning the eggs. Single birds walked between the nests, in a strangley hunched posture, their flippers streched forward close to their bodies, walking with a rather hurried gait. John Warham called this walking style the “slender walk” and seeing it here I must say I wouldn’t be able to find a better term for it. Some of the slender walkers were heading out of the colony, others were coming in. Whenever a walker got too close to a breeding pair it was pecked at by the nest mount’s tennants. Interestingly, most of the walkers that were coming in ended up somewhere between nests, rather than arriving at a nest site. Apparently most of them were non-breeders. This made me wonder why the hell they would want to run the gauntlet when they don’t really have a destination. I guess its all about pretending to have a destination. Perhaps they even had a nest site somewhere in colony and have failed since? Perhaps their hormones make them believe that there must be a nest of their own somewhere in here even though there isn’t? We had approached the colony from the North and Melanie decided that the spot would be ideal for her project. She plans to build a viewing hide for her observations, so she needs room and a relatively level area that is not too exposed to winds. Although Dave nodded he pointed out that officially we’re not (yet) entitled to work up here. He added that we would need to get approval from the DOC headquarters in Invercargill first. After all the quarrels we had with DOC Southland to get the permits to come here I agreed with Dave. I didn’t think (to be honest it was more hoping) that we’d have problems getting the Okay when we point out that A4 just won’t cut it for us. Melanie seemed quite unfazed by all this and started her work straight away. Dave and I left her and re-entered the forest to hike around to the southern side of the colony. When we re-emerged onto a small grassy patch on the opposite side I was once again overwhelmed by the size of the colony. From here we could oversee the entire colony and it was incredible how many penguins can fit into your field of view! After we had lunch back at the hut Dave radioed the mainland. No objections (!!!). Colony A3 is our new worksite! Excellent! The rest of the day Dave and I were busy setting up the station. We fixed the solarpanels to the roof, re-installed the satellite phone (didn’t work properly), laid out cables from the generator (under the lower hut) to the main hut, and by afternoon it all looked like a sophisticated chaos of cables, boxes and ropes. We’re all set. We thought. Melanie came down and asked us whether we could help her with her viewing hide.There are some bloody bulky, bloody heavy sheets of plywood that she needs carted up the hill tomorrow. That’s gonna be fun. 22.00 hrs – Jesus Christ! I am all shaken up! I need a Whisky or two! I think I just looked death in the face. Dave and Melanie are still dabbing the tears off their cheeks, the bastards. Five minutes ago it happened. I had to pee. It was dark. Hence, I grabbed my headlamp and stepped out into the darkness, that was filled with the neverending honking of millions of sooty shearwaters (or Titi). Quietly I sneaked along the boardwalk, continously shining my torch to the left and right. I wasn’t to keen to get a sudden bark of one of the pelty giants. I slowly made my way to the 90° bend and peeked around the fern bush to check if the big guy who had slept there all day was still here. I squirmed under the fern bush but all I saw was an empty mudpatch – no sleeping fur bearer? Slowly, oh so slowly I sneaked around the corner to get a better angle to check that there definitely was no sealion waiting to jump at me. Indeed! No sealion under the fern, what a relieve! Phew, I thought and took a big, relaxed step towards the rocks… and stumbled right into the collosus that must have woken up only a few minutes earlier and decided to enjoy some fresh air – right on the boardwalk. I litteraly kicked the sealion in the bum! 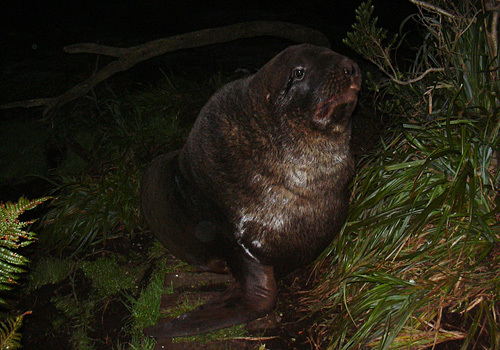 I almost suffered a heart attack, when I suddenly felt an odd shape underneath my boot (the sealions tail) and a enormous head swung round in the darkness and plate-big eyes stared angrily at me… or so. My heart seemed to search for an escape route somewhere in my throat, my eyes were wide open in shock. With flying colours I lept round and fled in a new record time back towards the hut. 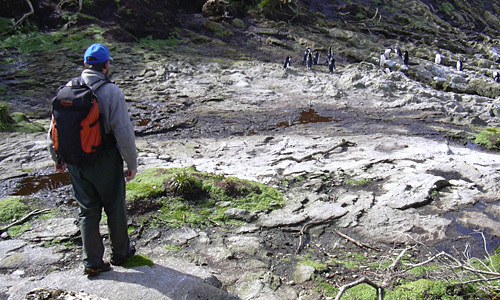 All the way I had the feeling that something very big and smelly was hard on my heels, I almost felt the beasts hot, smelly breath on my neck… any moment I expected to feel its teeth digging into my shoulders… or even worse… I imagined being flattened by half a ton of angry sealion! I slammed the door shut and shrieked to the the others “We gotta barricade! There’s a monster behind me!” I quickly explained what just happened and told them that I was certain that the Barney-from-hell was preparing to storm the hut. And what was their response? Laughter! Malice! Ridicule! But wait till they have to go out to pee! I warned them! I really did!